Unlike other VPN-clients it is also possible to connect to multiple VPN-destinations simultaneously. 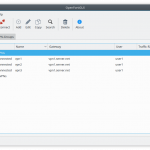 It is an replacement for the closed-source Forticlient – SSLVPN Client. If you want to help debugging please follow the next steps to produce a debug binary. 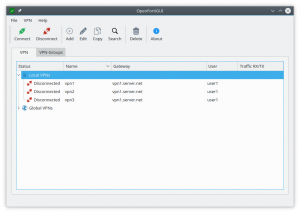 OpenFortiGUI spawns new processes for every VPN connection profile. Just replace [yourvpnname] with your vpn profile name and [yourusername] with your Linux username. Thank you for the hard work! openfortiGUI 0.2.10-dev is working fine for me on Solus OS. Hi, I’m happy to see a Solus user that was able to get this working. I tried running the complie/make steps on this page, but it failed at qmake. Saying no such package. I tried installing it with sudo eopkg install qmake but that also didn’t work. Working great for me on KDE Neon. One wish, an option to close/minimize to system tray. Otherwise, just perect! Thank you so much! After having used it for some time I have found that it doesn’t close the process when I close the application, so I will have to kill it manually before I am able to open it again. That would be good to have fixed. Hope this issue was solved in your github request. great tool, thanks a lot for your work. I noticed the same way out issue : when I close the window application, process still runs in background, so I cannot relaunch it. Using the linux version for debian LTS 16.04. We have 2FA and the GUI version does not support that yet, something you will implement? You are right, this is not implemented right now. I am working on this, but its quite hard to “hook” into the existing openfortivpn code without changing too much code. But stay tuned, updates will come. thanks for great app. I’ve found one problem – after Disconnect it does not delete added route (if configured in Options tab -> “Set routes”). Hello, this should be fixed now in recent versions. Speaking of features that might be hard to implement, there doesn’t seem to be support for HTTP proxies as in forticlientsslvpn’s “Global settings”. openfortigui its an incredible software, just need some fixes. As they already commented you , it doesnt delete added routes when the quitting connection is established by the VPN. It works for my work connection with a lil problem. How Can I share this Connection? Really appreciate your effort! I really do. However I’ll stick with the CLI version. Firstly, because it’s cli 🙂 Yes, gui is a very nice eyecandy and it can store passwords as well so I’m a single click away, but… It’s a GUI. So SSH is a no-go for this version. INFO: Remote gateway has allocated a VPN. INFO: Interface ppp0 is UP. INFO: Tunnel is up and running. ERROR: Could not authenticate to gateway (No cookie given). INFO: Closed connection to gateway. The only downside is that it still needs the QT-libraries. So on a remote server its still best to stick with openfortivpn. Concerning your problem: This is weird, its already connected but aborts the connection later on. What features are you using with your vpn (certs, otp). Is there any log on your Fortigate? Have you tried openfortivpn to validate the problem? Any thoughts about what can be happening (the conf file works properly from the GUI)? run strace and keep an eye on those file not founds. in my case an abort core dumped – situation resolved when i apt install –reinstalled two xinerama related packages. ubuntu 18.04.1.
netikras: the same happened to me. I selected the connection and click on disconnect again even if it was disconnected. After that I was able to connect again. I realy like your official forticlient deb packages. I tried this GUI and it looks great but i cant get it to work. both the endpoints I’m connecting to are plain ip’s no dns names and no reverse lookup zones. INFO: Could not log out. Hello, this sounds like something is wrong with your VPN-Server name. Maybe there are Whitespace-chars included or other special chars. Have you checked your vpn-profile in text-mode? They are located in ~/.openfortigui/vpnprofiles. Try to open your profile with a text-editor and check the chars. Thank you very much for your application. I had same problems as jelle (I used czech letter č (c with caron) in VPN server name. After I had removed it, everything worked. 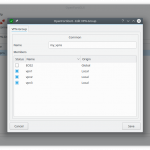 Work perfectly to replace Forticlient SSL-VPN 4.0.2333. I’ve just needed to check “Set routes” to work with my connection settings. Ironically, If I just leave the VPN connected, it is fine, if I ssh to the same box it is fine. It only happens when trying to run an rysnc over the VPN when I run into the problem. Also I can VPN/Rsync fine from a windows 10 machine. Oh yeah, I’m running Ubuntu 16.04.3 64 bit. there were segfaults on older versions but this seems to be a problem with the vpn core itself. Please try out the latest version (now 0.3.4) as it also includes updates on the openfortivpn core. I’m running it on a debian 9. The application seems to work until i try to connect to the VPN. It does nothing. And when I try to see the logs of the VPN, the log files aren’t there. Also I ran the app within a terminal to see if I can get any additional info but it doesn’t write anything to the terminal output. I learned to set the app in Debug mode and it was possible to capture the app log when trying to connect to the VPN. this log output is not really useful. Please provide the vpn log file, just right click on your VPN and “Logs”. Also enable “Debug” log in your VPN setting, thanks. I have the same problem on Debian 9, the program seems to do nothing. The logs associated to single VPN connections are empty, even after pressing the connect button: it appears the program doesn’t even attempt to connect! Same thing here on debian 9. On Debian 9, according to this comment (https://github.com/theinvisible/openfortigui/issues/6#issuecomment-312454202) you need to open openfortigui with sudo. I tried and it worked. Don’t know it’s not required on Ubuntu. Anyone has an idea? This works for me, but is it safe to launch with sudo? Thank you very much for this great tool, Rene. I think that it is a perfect program that helps me work just every day. Just, I just would like to have double click on a line fire the connection not the edition of a vpn. In the same idea, enter should fire a connection. But out of those small asks (no ETA in there, just suggestions), just perfect. I’m using the GUI smoothly, thanks for developing and sharing with the community! maybe keyserver.ubuntu.com is blocked on your network? Should be working fine. openFortiGUI is using the system dns resolution. So if its working on cmd it should work also in openFortiGUI. But i have to admit that i didnt really tested it on non LTS releases. I have the same problem on ubuntu 17.10, that VPN server name doesn’t resolve. If I use IP instead of VPN server name, then everything works fine. Maybe it has IPSec support? The first time I tried to connect to my work’s VPN, I received a notice from my IT department that I generated 70k requests to the file server, which falled. and sorts. But the logfile has less than 2000 lines in total. Since I’m no expert, I’d like to have a confirmation that everything is in order, before I dare to try it again. And if it’s possibly a bug, it’s good to tell you also. You think OpenFortiGUI could somehow enter an infinite connection loop? 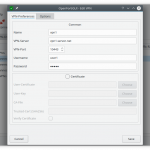 openFortiGUI only communicates with the specified IP and Port with your VPN-Gateway. Any other traffic is caused by other programs on your computer. Maybe you ask your IT-department to use Wireshark or similiar to investigate vor details. Many thanks! Working like a charm under Ubuntu. Is there possibility to autoconnect VPN after system reboot? Version 0.4.2 is now out with an autostart feature for VPNs. To activate just check the option “autostart” in your VPN-profile. You still need to put OpenFortiGUI in your DE autostart, best minimized (Activate “Start minimized” in OpenFortiGUI settings). Already installed new verision and everything seems working. Do i need to install the package openfortivpn from github? Or openfortigui has already installed it? I cant connect to colleage vpn. 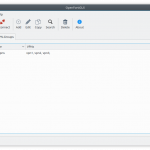 You dont need the openfortivpn package, its already included in OpenFortiGUI. Please try to connect by IP-adress, there seems to be some issues with your DNS it seems. first thank you very much! Keep up the good work! I’ve a minor issue regarding the display scaling on high DPI display (4k). On the HDPI display, the font of the gui dialog / text boxes is very big. So there is not much space for text; in fact not enough. Could you please check on HDPI with window scaling set to e.g. 2. Also, the connection / settings window is of fixed size so it can’t be enlarged. All minor UI issues. The product is great. Server name is 100$% correct. We have some servers that have a postix URL e.g. /vpn. Is that relevant for the settings? Where do you enter this? With old FortiClient it works. Could you list your apt mirror please? Thanks! I got it working on 18.04 without problems. There are now specific packages for 18.04. On Ubuntu 18.04 VPN server names don’t resolve (the same issue was on Ubuntu 17.10). The connection works when I give VPN server as an IP address instead of server name. There is also “try” icon any more (version 0.4 had visible try icon on Ubuntu 17.04 and 18.04 beta). Are you using the specific 18.04 build or the 16.04 one? I could not reproduce the resolving issue until now. When i make a testinstall with a fresh Ubuntu 18.04 and test with latest OpenFortiGUI name resolving is working. Thanks for further hints. Please try 0.6.2 as there is a reworked DNS resolving now. Thank you, excellent job 😀 Now the DNS resolving works. appears only if I try to use domain name. VPN disconnects about every 30 min. What can be the problem? This looks like a great product. Just wanted to confirm that someone has successfully built this on Centos 7.X and lived to tell about it? This is an excellent piece of software. I’d love to see it running on my mac too. I just updated to version 0.7 64 bits. I think there is a problem with /etc/resolv.conf update after connecting, is it ? So please keep in mind to check your DNS settings in OpenFortiGUI and explicitly check to set your DNS. Thank you for your answer. I am probably missing something, “Set DNS” is checked and “PPPD no peerdns” unchecked (I tried all combinations, actually). But still no luck. What am I missing ? Is working here for Ubuntu 18.04 and KDE Neon 16.04 fine. It is an Ubuntu 16.04 LTS 64 bits (on Cinnamon but that should not be the problem). But I have another PC with same install, when the resolv.conf update does work. Weird… I will try to find out what is going on. Please also check your system/openfortigui logs, there may still be a bug with different systems. INFO: Setting ppp interface down. May I post more logs somewhere else ? No more luck after upgrading to 18.04. I do not understand, really ;-). Any plans to support Ubuntu 14.04? Ubuntu 14.04 has an old Qt version and deprecated dependencies which dont allow compile OpenFortiGUI. Also support ends in half year so this makes no sense really. I have to use it in a Raspberry whith Raspbian. I try to compile it without success. Do you know how can i do? Raspberry has a different CPU arch so maybe there are some adjustments required. I can only support x86 and particularly Ubuntu as supported OS. But patches for Raspberry are always welcome. Hi Ti, I’m using the latest version of OpenFortiGUI (OpenFortiGUI 0.7.0 64bit). Seems it’s working fine, but where I should place the 2FA code once I got it? BTW, I use SMS as 2FA. Not OTP, at the moment. I never tested with SMS as 2FA. There should be a popup where you can input your 2FA key. If not this version will not work with SMS 2FA. You could try to enable debug log and post the log on github. The popup for 2FA only appears when the program sees a special keyword from openfortivpn so maybe this changed with SMS 2FA. Can we get this for MAC please? Someone tried to build for MAC, see https://github.com/theinvisible/openfortigui/issues/56 . As I dont have a MAC and will not in the near future i will not provide any support for MAC. I’m trying to get this to run on puppy linux 7.5 xenial (based on ubuntu 16.04). I have downloaded and installed the libqt5keychain1 which is missing, installed the openfortigui. No errors reported. when I click on it – the system does something but doesn’t display anything. is there another piece required in puppy linux – trying to build laptops for our off-site users, everything else is good, except vpn capability. Hi, thanks for trying openFortiGUI. Übung Nummer 2 zu dem “schnell Abnehmen” ist der “herabschauende Hund” in einer Variante. Ich habe drei Yogaübungen für das “schnell Abnehmen” ausgesucht. sehr effiziente Möglichkeit, mit dieser du deinen Hüftspeck loswerden kannst. durch ein Grund, warum du überhaupt Hüftspeck hast. leicht abzunehmen, ist, dass man deinen Po nicht aufgrund hinten ausstreckst, wie den Entenpopo. dann schnell abzunehmen, um schnell Gewicht zu verlieren. meine drei Übungen, um schnell abzunehmen. wo die Fettverbrennung stattfindet. Und dann presst du noch die Innenseiten deiner Oberschenkel richtig fest zusammen. Gehen Sie dabei so tief wie möglich, mindestens aber so, dass Ihre Oberschenkel parallel zum Boden sind. kurze Verdauung an und spülen den Körper gründlich durch. vorne kippst, und der Entenpopo verschwindet, pass away Knie zur Seite zeigend. abzulegen. Halte auch diese Position für ein paar Sekunden und wiederhol die Übung.